Peanut butter is a staple of the average American kitchen. It’s a favorite in the lunch boxes of school age children, college students, and archaeologist’s in the field. And although the peanut has been widely cultivated for a long time, peanut butter as we know it today only dates to the late 1800s. In 1895 John Harvey Kellogg (yes that’s Kellogg) applied for a U.S. patent for a nut butter made from peanuts or almonds. By 1896 the Kellogg Company was producing nut butter on a small scale. By the turn of the century peanut butter was fairly widely available from commercial sources, as it gained popularity following the 1904 St. Louis World’s Fair. By 1922 there’s even a National Peanut Butter Manufacturers Association (Shurtleff and Aoyagi 2015). 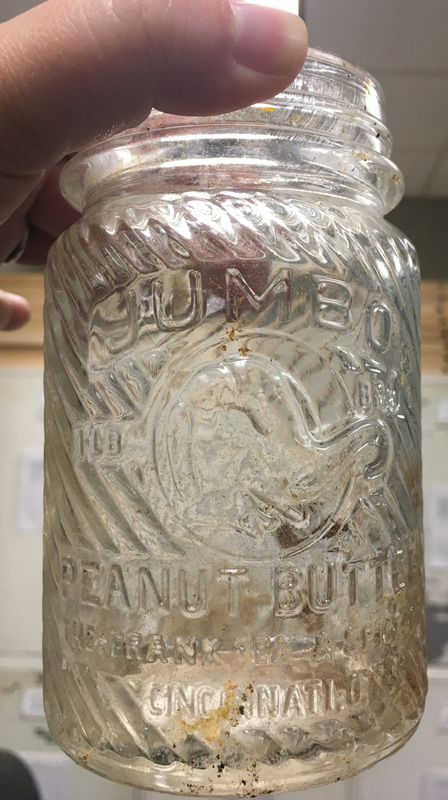 Jumbo Peanut Butter Jar from Brody/Emmons complex. There’s a single peanut butter jar recovered from the Brody/Emmons amphitheater excavations: Frank’s Tea & Spice Company Jumbo Peanut Butter. In 1896, Jacob, Emil, and Charles Frank founded the Frank Tea & Spice Company in Cincinnati, Ohio. The company originally sold small, shelf-size packages of whole and ground spices. They later expanded their offerings to tea, spices, peanut butter, and olives (American Jewish Archive). However, their most famous and most enduring product was Frank’s RedHot® hot sauce, first produced in 1920 (www.franksredhot.com). Unfortunately this jar doesn’t have any makers mark or date stamps. 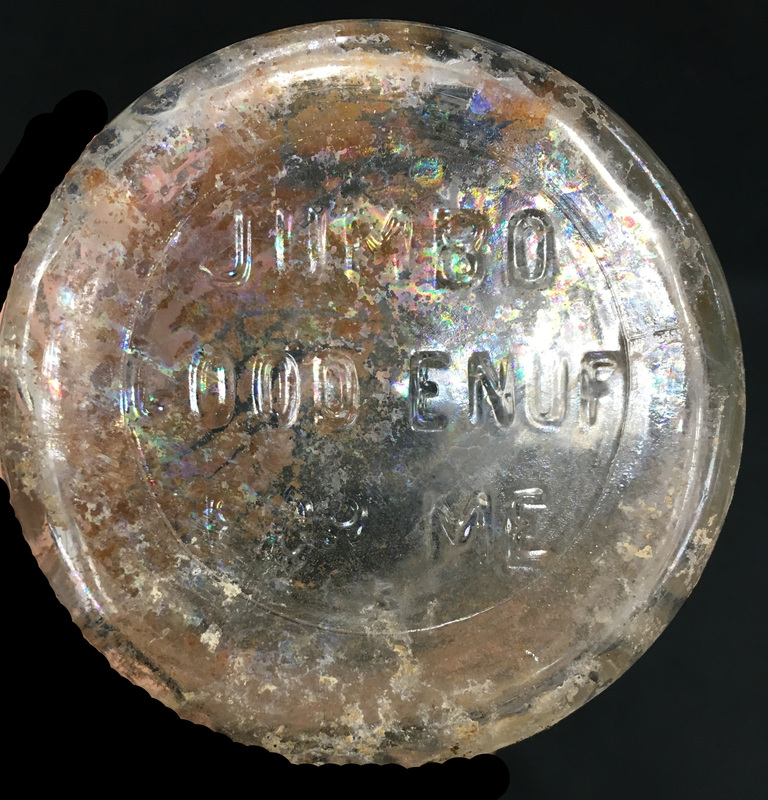 The overall construction of the jar, and the date range of the other artifacts recovered from the Brody/Emmons complex suggests that this jar is from the 1930s. Information about their Jumbo brand peanut butter is spotty. We know that the Frank Tea & Spice Company applied for a trademark on the world “Jumbo” in 1927 (Shurtleff and Aoyagi 2015). So, why Jumbo peanut butter? To unwrap this decision, we need to look to the elephant on the jar. Jumbo and his caretaker. Image source. Well, today jumbo as a word is part of every day speech – a word to describe something that is large. Merriam-Webster notes that the first use of the word was only in 1883. That’s because the common use of the word comes from Jumbo the Elephant. 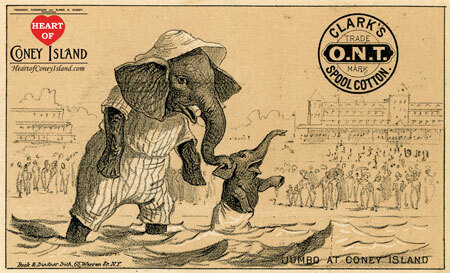 Jumbo was the most famous elephant of the 19th century. 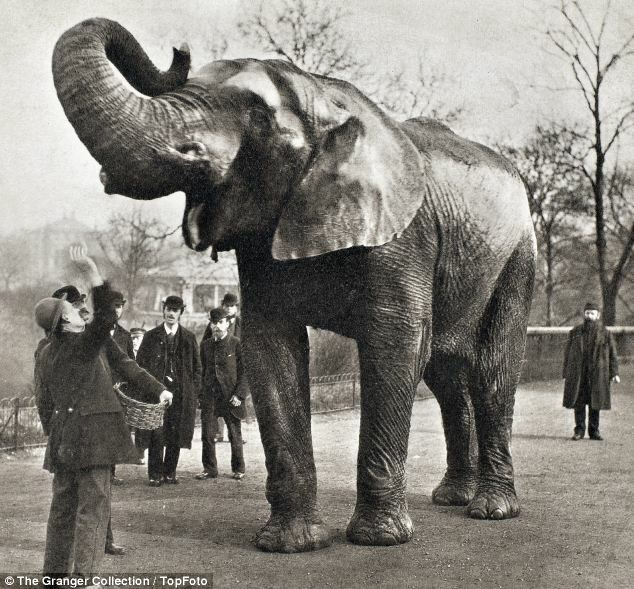 He was sold to the London Zoo in 1865, and became famous for giving rides to visitors. 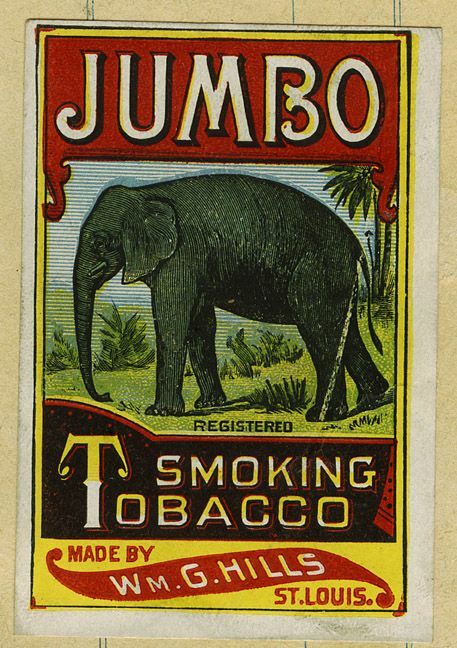 Jumbo was fold in 1882 to Barnum & Bailey Circus, where he quickly became their most popular attraction. Jumbo was a beloved public figure and was featured on soda bottles, popcorn bags, matches, playing cards, puzzle, children’s toys, and even used as advertisement for tires and spark plugs (http://now.tufts.edu/articles/glory-was-jumbo). Jumbo smoking tobacco ad. Image source. 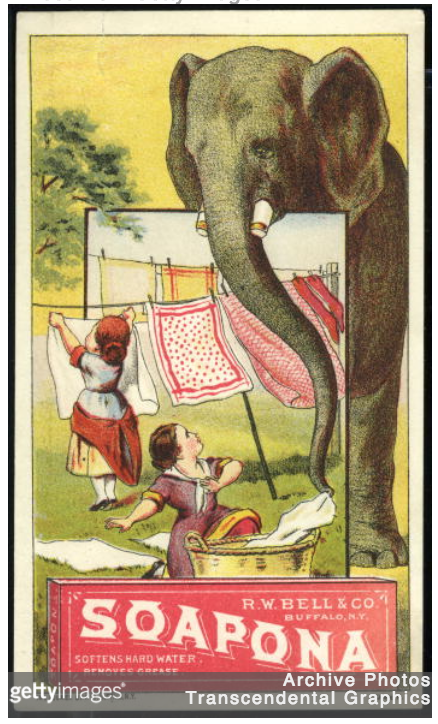 Jumbo brings soap trade card. Image source. Jumbo at Coney Island. Image source. 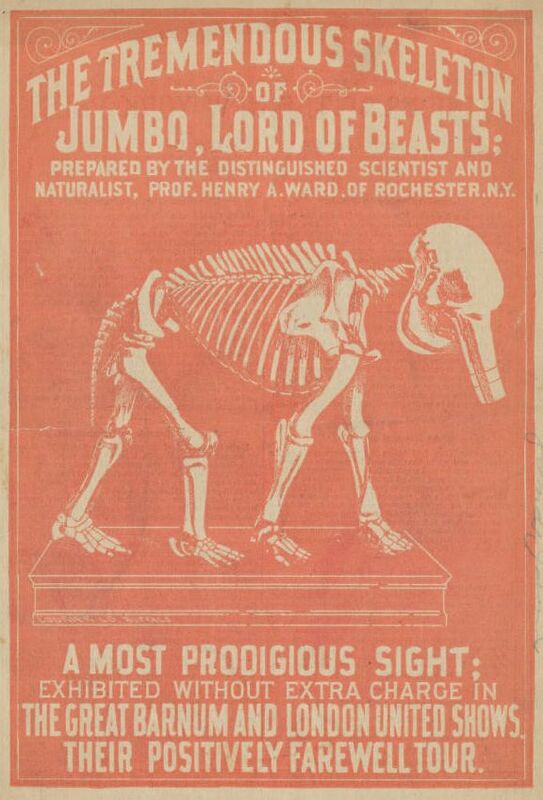 Advertisement to see Jumbo’s skeleton at the circus. Image source. Jumbo peanut butter elephant shaped jar. Image source. The fact that Jumbo had died more than 40 years before Jumbo Peanut Butter was produced speaks to the endurance of his legacy. And the connection between elephants and peanuts. Elephants don’t eat peanuts as part of their natural diets. However, roasted peanuts were popular fair at the circus, and were often purchased to feed elephants. So perhaps Frank’s Tea & Spice Company was playing on national nostalgia in naming their peanut butter Jumbo. Although our jar only has an image of Jumbo, they also produced small jars in the shape of an elephant (wouldn’t that be fun to find!). Jumbo Peanut Butter was also known for the eclectic sayings on the bottom of the jars including “Try Jumbo Peanut Butter Sandwiches”, “Best for the kiddies”, or like our jar says “Jumbo Good Enuf for Me”. Bottom of Jumbo Peanut Butter jar from Brody/Emmons complex. Reads “Jumbo Good Enuf for Me”. 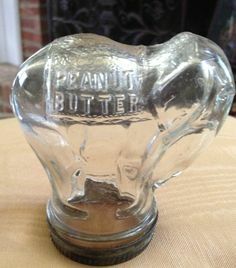 When I started researching this peanut butter jar I never imagined I’d be learning about a famous elephant (but that’s what makes research fun!). Jumbo the elephant impacted many facets of history: rise of mass entertainment/pop culture, museums, advertisement, ever our lexicon. To learn more about Jumbo, and the wild rumors P.T. Barnum concocted about his death, check out the information video produced by Tufts. William Shurtleff and Akiko Aoyagi. 2015. Origin and early history of peanut butter (1884-2015): Extensively annotated bibliography and sourcebook. Soyinfo Center. Great post, but I’m really confused about where Brody/Emmons amphitheater is. Could you or should I say, have you included a map of these areas with some of the roads surrounding the campus to give us a good reference. Thanks for the comment, and great idea for future blog posts. The Brody dorm complex is on the corner of Harrison and Michigan. Before the dorm was built in the 50’s, it was the site of the East Lansing dump. The bottom saying on my jar is: “ALL THE CHILDREN LIKE JUMBO” and there is a 7 under the saying. Enjoyed your research. I found a jar fragment with enough to find your site. I live in Ripon, WI and found it in a midden by a smallish drainage gully the feeds into the mill pond. Thank you for your work. How weird… I just bought a jar full of buttons about a month ago and just noticed the jar and is one original of this jumbo elephant ..